Lock in a great price for Comfort Inn Boardwalk – rated 8.9 by recent guests! Clean hotel, friendly staff, breakfast was great, heated indoor pool, restaurants and shopping nearby. Balcony overlooking the ocean. Great location for spending time on the boardwalk. A lot of restaurants nearby. Didn’t have time to use the pool but that was one of the drawing points. Daryn at check out was extremely nice. He answer all my questions, help with information on local restaurants in the area. Over and above Customer Service. We planned a last minute vacation to OC for the night. Hotel was reasonably priced. Staff was very friendly. Room was clean and tidy. Everything was wonderful! Will definitely be staying here when we visit OC again. Breakfast was great. Proximity to beach was also ideal. Parking was convenient. Check in was seemless process. Right on the Boardwalk, an indoor pool which is great for off season and a continental breakfast. I was quit happy. The fact that I was by the beach & Boardwalk. Saw the trees & people outside. Comfort Inn Boardwalk This rating is a reflection of how the property compares to the industry standard when it comes to price, facilities and services available. It's based on a self-evaluation by the property. Use this rating to help choose your stay! One of our top picks in Ocean City.The Comfort Inn Boardwalk is located near Ocean City Beach and the Ocean City Boardwalk, offering shopping, dining and entertainment. The Ocean City Municipal Airport is 5 mi away. Free WiFi is offered as well as free on-site parking. 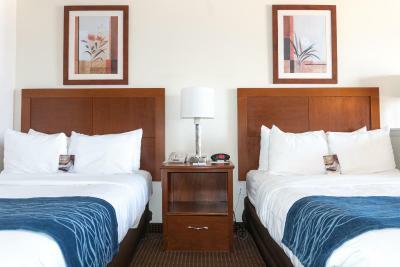 All guest rooms feature cable television, safes and kitchenettes with refrigerators. Guests of this Ocean City hotel are invited to enjoy the indoor heated pool and oceanfront outdoor pool with sundeck. The Ocean City Convention Center is 2.4 mi from the hotel while The Ocean City Factory Outlets are 1.6 mi away. 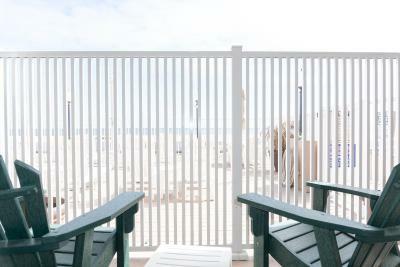 When would you like to stay at Comfort Inn Boardwalk? This room features a sofa bed, refrigerator and flat-screen cable TV. This room features a sofa bed, balcony, refrigerator and flat-screen cable TV. House Rules Comfort Inn Boardwalk takes special requests – add in the next step! Comfort Inn Boardwalk accepts these cards and reserves the right to temporarily hold an amount prior to arrival. No wifi, hot water takes a while to get hot. I didn’t like that my hotel wasn’t beachfront. Hence the name is comfort inn boardwalk. I was in the second building facing other hotel properties. Coffee was not strong both at the breakfast and room. The man on reception was lovely, he was super helpful, welcoming and kind! (04/09-04/10) the room was excellent, very clean and an amazing size. The beachside view from the balcony was awesome and we felt safe enough to leave the balcony door open all night. The breakfast could have been better.... Maybe a little more variety. Other comfort inns we have stsyed at had donuts, bagels, sausage, bacon eggs, fruit, blscuits & gravy available on alternating days.... Just a suggestion, nothing was wrong with your breakfast just needed more variety. Our microwave had lots of crumbs. The continental area was too jammed with furniture like the tables and chairs didn’t function with the space. Indoor pool. Cleanliness. Daily hot breakfast. Coffee, water and juice available all day and night. Friendly staff including housekeeping staff and breakfast staff. Ocean view.